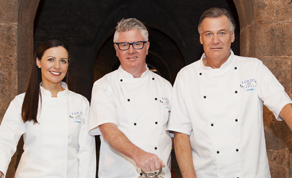 Ahead of the series finale of ‘Lords & Ladles’, which airs on RTÉ One this Sunday, July 15th, IFTN caught up with Mind the Gap Producer Bernadine Carraher to talk about the success of the third season. ‘Lords & Ladles’ is an original factual entertainment format that takes the viewer on a historical journey to celebrate Ireland’s past through the wonders of food and the glories of cooking. Now in its third season, the show has proven a hit with people of all ages as the format merges food, cooking and history into a fun and innovative mainstream format that provides perfect family viewing. The show was nominated for IFTA Best Factual Entertainment in 2015. ‘Lords & Ladles’ is produced by Mind the Gap Films with funding from the Broadcast Authority of Ireland’s Sound & Vision initiative and Section 481 Tax Incentives for Irish filmmaking. The series finale of ‘Lords & Ladles’ takes place this Sunday, July 15th at 6:30pm.